Plenty of convection about so it is certainly not over. Lots of highcloud about so this suggests numerous redevelopment phases within the diurnal cycle today so it could reform one more time. Nice tops to the NE around the Warburton region with pileus. 8C drop at Cerebus with 3mm of rain in quick time and should clock up about 5-10mm there and similar for Phillip Island at this time. Not much wind with it. About 30-35 knots which is about par in these situations. I think the main area of thunderstorms is now in that Ballarat region. Looks similar to when Lilydale got hit last time, but more Westerly and less chance of cell convergence from N to S.
Karl Lijnders wrote: Could split up for a period over the western suburbs but should develop over the east again from where DJ speculates. I really hope your wrong karl, we are long overdue for a decent storm out this way. wow did the You Yangs, split that rain band? Some very interesting looking clouds out there at the moment, but the radar just looks like it is moving down away from here, and the band around Ballarat I think may ead towards the Macedon Ranges. Ballarat cells seems to be weakening....will this be a non-event due to lack of warmth from now onwards? Took some tasty pics of the approaching line. Shall upload tonight and spread the love! Hi there Sebastian...enjoy the weather mate!! I think it will be a non event in Melbourne but around the region there is some fairly good results, to the NW and SE but still some time. Warmth not the issue ILS. Just had a look again out there and plenty of knuckles across the western and southwestern sky so it is regenerating!! Very odd sky out there.. Seems to be developing along the wind change at the moment. Winds still yet to shift here. Development seems to be rapid north along the line between Ballarat to Paky. Cheers Karl! 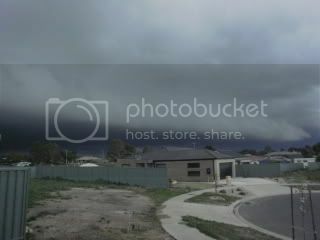 I do hope everyone East of my locality has some sort of interesting weather arvo. It's getting quite dark outside as that cell from ballarat approaches but is definately weakening. Sky was dark and just lit up now in Moorabbin, however only an isolated shower band passing through. Looks like Bacchus Marsh and Pakenham are getting some heavy falls. Should form a line in the clear slot between Ballarat to Paky. I cannot beleive the depth of roll cloud as it came through here, almost a shelf cloud. Pics to follow. Looking more likely now for showers and thunder. Sone nice Cj's going up and CB's starting to grow nicely now all around me to my northeast, and south west, but a huge clear slot right over us. haha. Well take some nice pics for me guys and girls. Im expectng a couple of sparkies on sunset. Gone very dark now and the wind has quickly picked up. Will be happy with one rumble. a cell seems to have developed to the west of melton. Clouds look impressive as they have for a while now, but only now has it started to drizzle. But I expect something nice in the next half an hour. A few drops starting to fall here, if that cell holds it's line and intensity we might be in for some action Norfolk. Starting to get a few massive drops here so the line is starting to take shape. About 2-5mm across the region over coming 2 hours and then fine tonight. Chance of showers and a storm tomorrow afternoon too. well that was a hmm intersting storm. Looked impressive but was rather benign. Lightning was few and far between. Total rain for today 6mm. The temp peaked before storm at 18 and fell to 12 after. No wind to speak of. GFS has LI upwards of +8 tomorrow so I'm not sure where the storms are coming from there unless that model is grossly wrong. Some interesting development very close to the S and SW but it's generally weakening here and won't make it.